Photos of a boy wearing a watermelon in Wenzhou, a city in eastern China's Zhejiang province, have gone viral online. While some internet users joked that wearing a watermelon is perfect to cool down in the summer heat, a doctor warned that wearing the fruit can also be harmful, reports Chinese Communist Party mouthpiece People's Daily. 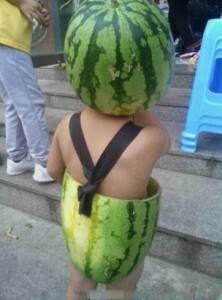 A netizen uploaded three photos taken on Chengxi Street in Wenzhou, with a boy wearing a hat and bottoms made out of a watermelon. The boy was also wearing anklets made out of watermelon peel. "No need to fear the heat this summer!" said the caption along with the photos. The photos have been wildly shared online with netizens commenting on the cuteness of the boy, with others saying that the boy's parents are creative and even environmentalists. However, a doctor said that although watermelon is unlikely to cause an allergic reaction if worn by adults, it could harm a child's skin. The doctor added that parents can dress their children in watermelon peel for fun, but should not let them wear it for long periods of time. China is in the midst of a brutal heatwave right now, but some parents have found a way to help their little ones beat the heat: watermelon.Only, they're not eating them - they're wearing them. 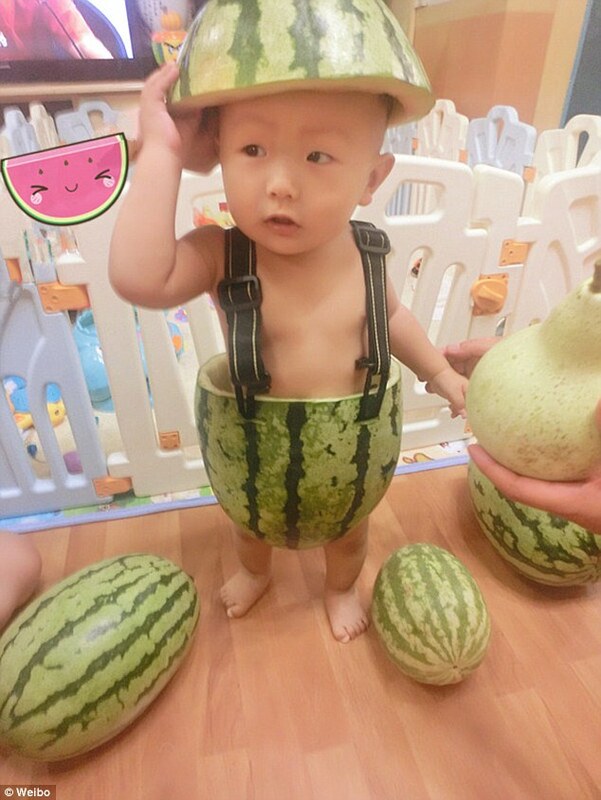 A trend started in July in the Wenzhou region of the country when photos of a kid dressed in a watermelon suit started making the rounds on the Internet. 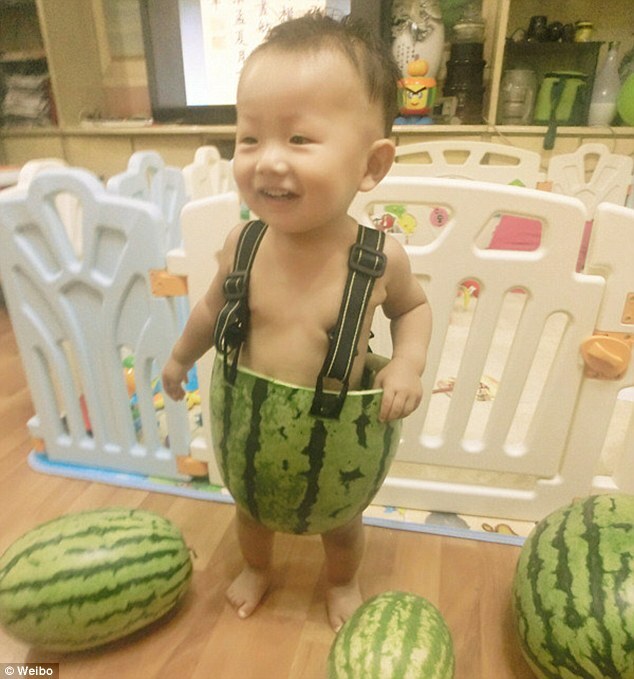 Eventually, the images made their way to China's microblogging service, Sina Weibo, and ultimately on to TV news stations.Pretty soon, parents across the country were making watermelon suits for their children - and some got rather creative. There have been watermelon bikinis, hula skirts and even watermelon armor - with some parents spending hours carving suits for their kids. The reaction to the suits has been relatively positive across China, with people commenting on various blog sites about how the suits are an 'eco-friendly' way to cool down kids in the blistering heat. One potential problem, however, is that babies have very sensitive skin. And while watermelon allergies are rare, the juice from the watermelon against a baby's skin could cause some irritation. Another potential issue is wearing the suit for too long. Watermelons rinds are moist, and as they rot they could breed bacteria and germs.